IS YOUR DUST UNDER CONTROL? Do you have these issues at your facility ? As soon as dust settles, it becomes a fire or explosion risk. dust control system will ensure you downtime for housekeeping is kept to an absolute minimum while keeping staff safe. 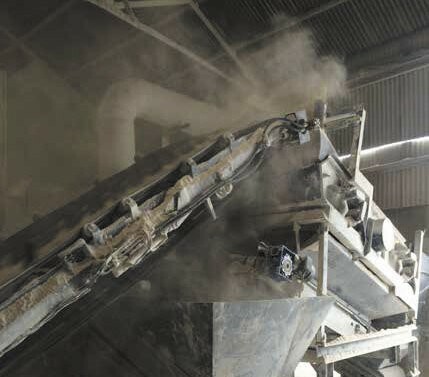 Impact has vast experience of dust control solutions, enabling us to offer simple yet highly effective methods for capturing dust at source, at conveyor discharge or transfer points. These dust control solutions can be integrated into your operations using stand-alone fully automatic filter systems or incorporated into other centralised pneumatic conveying systems. Fire/Explosion – Combustible dusts present an explosion hazard when suspended in certain conditions which can result in catastrophic damage. Occupational Health issues – Including an unpleasant working environment for staff, all dust types can cause respiratory allergies, infection and long term health problems such as asthma and chronic obstructive pulmonary disease. Maintenance Issues – An excessive build-up of dust can get into moving parts and create problems with the efficiency of operational equipment. Our systems are designed to adhere to the ATEX 2014-34-EU European Directive and US standard NFPA 654, where applicable.